Many on the left have been inspired by the protest of Native Americans and their supporters against the Dakota Access Pipeline. They have been horrified at the recent use of police dogs by private security to attack these protesters. Not so much the union leadership. 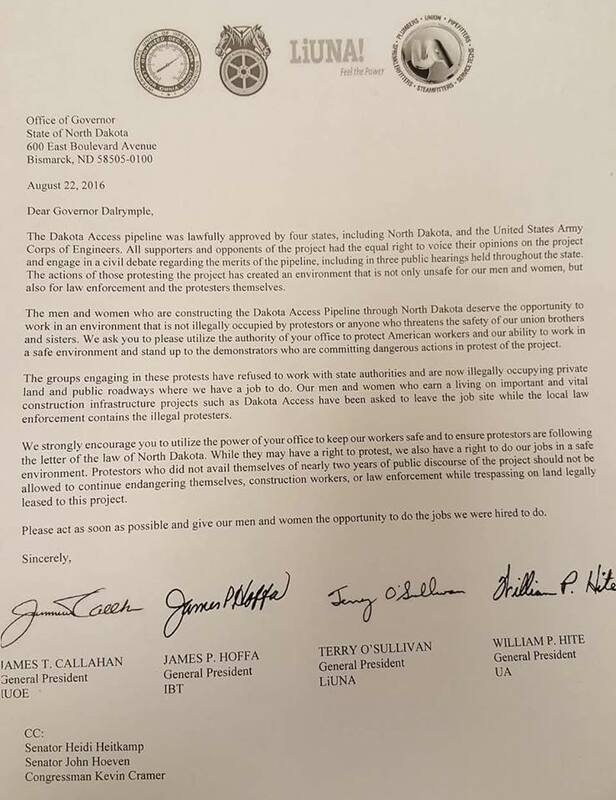 Look at this letter they sent the governor of North Dakota, urging him to “enforce the letter of the law”. What a disgrace! Meanwhile, all too many socialists try to ignore or minimize the significance of this approach of the union leaders in the hopes of getting some support from these same leaders for some campaign the socialists are working on. Years ago, Daniel deLeon called these leaders “the labor lieutenants of capital” – in other words, that they represented – were the lieutenants of – capital (the employers) within the labor movement. That is ever more so today. Socialists should be leading the effort to build opposition groups within the unions, not trying to curry favor with these lieutenants.